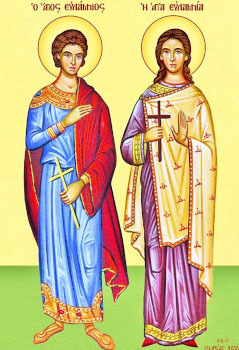 The Holy Martyrs Eulampius and Eulampia, a brother and sister by birth, lived at the beginning of the fourth century in the city of Nicomedia. Having read the decree of the emperor Maximian (284-305) putting every Christian under a sentence of death by execution, Eulampius became upset that the emperor, rather than going off to fight the enemies of his fatherland, instead was taking up arms against his own subjects. They brought the youth to trial and demanded that he renounce the Christian faith. For his refusal they first tore at him with iron hooks, and then they placed him upon a red-hot bed. Of a sudden the sufferer expressed a wish to visit the pagan temple. The judges were delighted, supposing that they had swayed the youth from Christianity. In the pagan temple of Mars the saint cried out: “In the Name of the Lord Jesus Christ I command thee, idol dumb and without soul, fall down upon the ground and be turned to dust!” The idol with a crash smashed down upon the ground. People exclaimed: “The Supreme God is the Christian God, great and mighty!” The saint again was taken off for torture. This time the sister of the sufferer, Eulampia, appeared before the judges and declared that she also was a Christian. Eulampius encouraged his sister: “Sister, fear not those killing the body, but unable to kill the soul” (Mt. 10:28). After tortures they threw the martyrs into a red-hot furnace, but the Lord protected them from the fire. Finally, they beheaded the brother, and the sister died from the tortures.